Financial comparison website Money Super Market have been cutting a disturbing line in television adverts that burn in to your mind for some years now. They don’t have cute meerkats or funny opera singers, but if those dancers hadn’t convinced you that the forces of mammon were evil then take note, they’ve made the day for Skeletor. 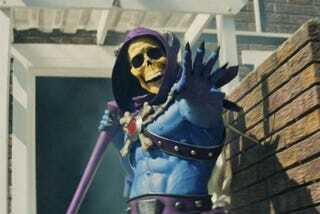 According to this behind the scenes video, Skeletor takes his cue from Prince of Darkness Mick Jagger. The ad was directed by Fredric Brown and made by an agency called Mother. NSFW: The Skeletor ad follows a series of spots which have included this little gem. And people wonder why we are mixed up in the UK.